Scandinavia sure is pretty, but she ain’t cheap. After doing a little deal-hunting detective work in the region’s dynamic capitals, however, I’ve happily determined that it’s entirely possible to set out for a budget break here, without breaking the bank. Whether you’ve set your budget-savvy sights on Oslo, Stockholm, or Helsinki (tip: though the latter gets a bad rap on value, it’s actually considerably cheaper than its Swedish and Norwegian neighbors), herewith some finds on fun free things to do, public transport “tours” to check out, and money-saving travel cards to help take the expensive edge off your outings. Free Attractions: If you’re in town on a Sunday, the National Gallery (home to an original The Scream by Munch), Museum of Contemporary Art, Museum of Decorative Arts and Design, and other museums offer complimentary admission, while the Oslo City Museum is always free. Or, visit Vigeland Sculpture Park, showcasing more than 200 sculptures by Norwegian artist Gustav Vigeland in an extraordinary open-air setting (pictured above). Peruse the mural-filled galleries of City Hall, where the Nobel Peace Prize is presented annually, or, for pleasant strolls in atmospheric environs, hit up the Botanical Garden, dating back to 1814, or the medieval Akershus Fortress, near the Oslo Fjord. Best Public Transport Tour: Hop on bus #30 past City Hall, up to the hip Grünerløkka quarter, and onto the Bygdøy Peninsula (with its numerous museums), before ending at the beach at Huk. Tickets cost $5, or are included in the Oslo Pass (see below). Money-Saving Sightseeing Card: The Oslo Pass gets you free public transportation, guided walking tours, and discounts on more than 30 museums and attractions. Pick up one- ($47), two- ($69), or three-day ($85) passes. Free Attractions: Get lost in the narrow alleyways and cobblestoned streets of Old Town, one of Northern Europe’s best preserved medieval city centers. Pop into its cathedral, Storkyrkan, the site of royal weddings and an array of impressive artwork (entry is charged during the summer months only), then make your way to the nearby Royal Palace to catch the daily changing of the guard ceremony. Discover cutting-edge Swedish design in shops like DesignTorget, 125 Kvadrat, and Design Stockholm, and sample the contemporary arts scene at free art galleries in the trendy SoFo district, or even in art-filled metro stations like Kungsträdgården. For a quick foray into nature, Stockholm is also the site of the world’s first urban national park at Djurgården, formerly used as royal hunting grounds. Best Public Transport Tour: On spring weekends and summer days, tram line #7 is swapped out for a historic tram car, serving up coffee and pastries, while whizzing past popular sights like the Royal Dramatic Theatre (a former haunt of Greta Garbo and Ingmar Bergman) and the island of Djurgården; tickets cost $5.40 or are free with the Stockholm Card. Money-Saving Sightseeing Card: The Stockholm Card offers free admission to 80 museums and attractions, a free sightseeing boat tour, and unlimited public transport. Cards are valid for one ($67), two ($93), three ($111), or five ($141) days. 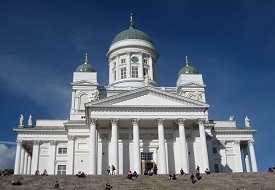 Free Attractions: Admission to all churches, city museums, and nature reserves in Helsinki is absolutely free. Don’t miss the Uspenski Cathedral (the largest orthodox church in Western Europe), the Temppeliaukio Church (a round church carved into a massive rock); or the Senate Square and its cathedral, Tuomiokirkko (with its gleaming white façade and prominent dome, pictured to left). Amongst free-entry museums, try the City Museum; or hit the Haltiala old-growth forest for a taste of Helsinki nature. World Design Capital for 2012, partake in special design-themed, free-of-charge events for a sampling of contemporary Helsinki design, and pop into Finish design stores along the Esplanade like Marimekko, Iittala, Arabia, and Artek. Best Public Transport Tour: Catch the 3T or 3B tram routes, which line many of Helsinki’s main sights, like Market Square, Senate Square, and the Finnish National Opera; rates are $2.80 per ride, or free with the Helsinki Card. Money-Saving Sightseeing Card: The Helsinki Card includes a free guided sightseeing bus tour, museum access, and unlimited public transportation. Rates are $45 for one-, $58 for two-, or $71 for three-day passes.